Emigrates to the West Indies. Spanish poet and historian; born 1625 at Montilla, Spain; died Feb., 1701, at Amsterdam. He was the son of a Marano, Simon de Barrios—who also called himself Jacob Levi Caniso—and Sarah Valle. His grandfather was Abraham Levi Caniso. To escape the persecutions of the Inquisition, Simon fled to Portugal, and remained for a time at Marialva, and also in the vicinity of Villa-Flor. Not feeling safe in Portugal, he went to Algeria. Miguel, his son, went to Italy and dwelt for a time at Nice, where his paternal aunt was married to the otherwise unknown Abraham de Torres. He then stayed for a longer time at Leghorn, where another sister of his father, wife of Isaac Cohen de Sosa, prevailed upon him to declare himself publicly a Jew. 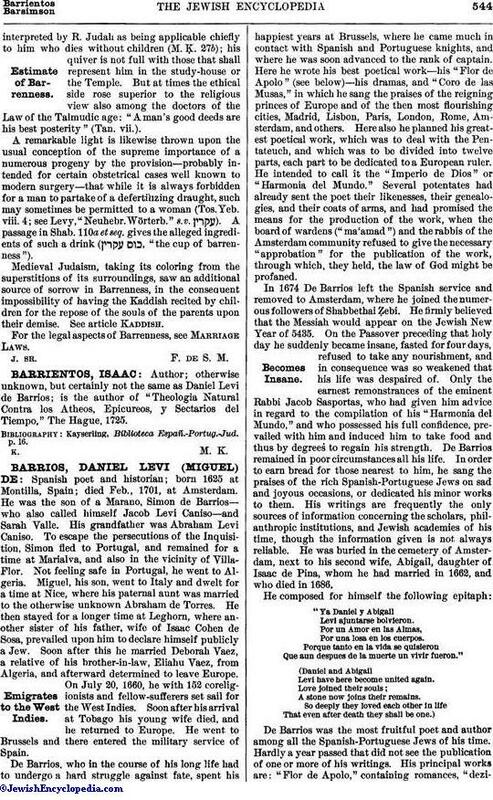 Soon after this he married Deborah Vaez, a relative of his brother-in-law, Eliahu Vaez, from Algeria, and afterward determined to leave Europe. On July 20, 1660, he with 152 coreligionists and fellow-sufferers set sail for the West Indies. Soon after his arrival at Tobago his young wife died, and he returned to Europe. He went to Brussels and there entered the military service of Spain. De Barrios, who in the course of his long life had to undergo a hard struggle against fate, spent his happiest years at Brussels, where he came much in contact with Spanish and Portuguese knights, and where he was soon advanced to the rank of captain. Here he wrote his best poetical work—his "Flor de Apolo" (see below)—his dramas, and "Coro de las Musas," in which he sang the praises of the reigning princes of Europe and of the then most flourishing cities, Madrid, Lisbon, Paris, London, Rome, Amsterdam, and others. Here also he planned his greatest poetical work, which was to deal with the Pentateuch, and which was to be divided into twelve parts, each part to be dedicated to a European ruler. He intended to call it the "Imperio de Dios" or "Harmonia del Mundo." Several potentates had already sent the poet their likenesses, their genealogies, and their coats of arms, and had promised the means for the production of the work, when the board of wardens ("ma'amad") and the rabbis of the Amsterdam community refused to give the necessary "approbation" for the publication of the work, through which, they held, the law of God might be profaned. In 1674 De Barrios left the Spanish service and removed to Amsterdam, where he joined the numerous followers of Shabbethai Ẓebi. He firmly believed that the Messiah would appear on the Jewish New Year of 5435. On the Passover preceding that holy day he suddenly became insane, fasted for four days, refused to take any nourishment, and in consequence was so weakened that his life was despaired of. Only the earnest remonstrances of the eminent Rabbi Jacob Sasportas, who had given him advice in regard to the compilation of his "Harmonia del Mundo," and who possessed his full confidence, prevailed with him and induced him to take food and thus by degrees to regain his strength. De Barrios remained in poor circumstances all his life. In order to earn bread for those nearest to him, he sang the praises of the rich Spanish-Portuguese Jews on sad and joyous occasions, or dedicated his minor works to them. His writings are frequently the only sources of information concerning the scholars, philanthropic institutions, and Jewish academies of his time, though the information given is not always reliable. He was buried in the cemetery of Amsterdam, next to his second wife, Abigail, daughter of Isaac de Pina, whom he had married in 1662, and who died in 1686. "Ya Daniel y Abigail Levi ajuntarse bolvieron. Por un Amor en las Almas, Por una losa en los cuerpos. Porque tanto en la vida se quisieron Que aun despues de la muerte un vivir fueron." De Barrios was the most fruitful poet and author among all the Spanish-Portuguese Jews of his time. Hardly a year passed that did not see the publication of one or more of his writings. His principal works are: "Flor de Apolo," containing romances, "dezimas,"62 sonnets, and the three comedies, "Pedir Favor al Contrario," "El Canto Junto al Encanto," and "El Espanjol de Oran," Brussels, 1663; "Contra la Verdad no ay Fuerca," Amsterdam, 1665-67, a panegyric on Abraham Athias, Jacob Rodrigues Caseres, and Rachel Nuñez Fernandez, who were burned as martyrs at Cordova; "Coro de las Musas," in nine parts, Brussels, 1672; "Imperio de Dios en la Harmonia del Mundo," Brussels, 1670-74 (the second edition contains 127 verses; the first, but 125); "Sol de la Vida," Brussels, 1673; "Mediar Estremos, Decada Primera en Ros Hasana," Amsterdam, 1677; "Metros Nobles," Amsterdam, n. d.; "Triumpho Cesareo en la Descripcion Universal de Panonia, y de la Conquista de la Ciudad de Buda," Amsterdam, 1687; "Dios con Nos Otros," ib. n. d. (1688); "Historia Real de la Gran Bretaña," ib. 1688; "Arbol de la Vida con Raizes de la Ley," ib. 1689. The opuscula, or minor literary and biographical works, of De Barrios appeared under various titles at different periods, in two different editions. They treated of the various "hermandades academicas" and "academias caritativas." The often-quoted "Relacion de los Poetas, y Escriptores Españoles de la Nacion Judayca" and "Heẓ Jaim (Ḥayyim), Arbol de las Vidas," which treat of the Amsterdam scholars, are of most value. Both have been reprinted, with explanatory notes, in "Revue Etudes Juives," xviii. 281-289, xxxii. 92-101. His last work bears the title "Piedra Derribadora de la Sonjada Estatua Desde el Año de 1689 al de 1700" (no date). 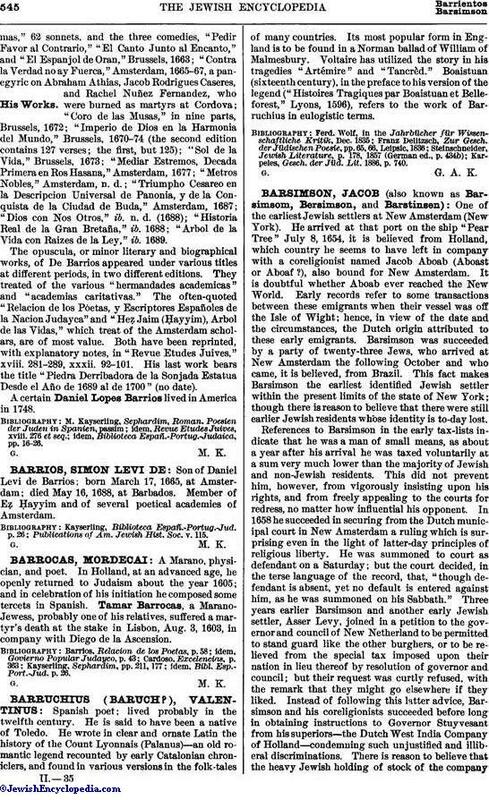 A certain Daniel Lopes Barrios lived in America in 1748.
idem, Biblioteca Españ.-Portug.-Judaica, pp. 16-26.